If your Reputation is lower than 3 you will be attacked by groups of three Flaming Fist Enforcers, a Flaming Fist Scout and a Flaming Fist Battle Wizard. The Flaming Fist will attack suddenly both on the streets and in Entar Silvershield's Estate. Enter the Helm and Cloak AR0116. Talk to Gorpel Hind at the bar. Tell him of your adventures. As you leave the inn Gretek and his Maulers of Undermountain (Arlin, Caturak, Nader, Pargus, Wilf) will appear and threaten you. Kill them. If you retreat to the bar Gorpel Hind's group will aid you but it is better if you secure all the kills yourself. If you talk to either of the two Guards three times they will attack. You can demand money (189gp) from the Noblewoman Sarah at a price (Reputation -2). Enter the locked house AR0157. He wants you to find Nester near Wyrm's Crossing. If you don't already have Nester's dagger head there and return with it. Raid the locked drawers and table. Enter the house AR0162. Talk to either one of the twin sisters Louise and Laerta. They fear the bogeyman. Gervisse will appear and blame a druid called Voltine for the boginess. Talk to Voltine who will blame Gervisse. Both your Journal and a Detect Evil spell will point to Gervisse as the villain. Kill Gervisse. Talk to Voltine. Then talk to Laerta. Raid the locked bedside table and locked wardrobe. Raid five locked drawers, the drawers in Room 205 are empty. Raid the drawers, the locked wardrobe and the locked drawers. If you want to avoid difficult theft and reunite a pair of lovers it is worth going to Cloakwood Druids to pick up Eldoth. 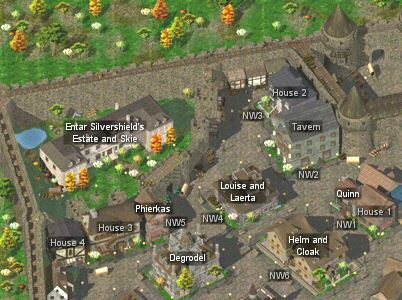 Return to this area and Eldoth will ask you to rescue Skie from Entar Silvershield's Estate. Agree. If you don't you have 24 hours or he will leave the party. Enter the locked estate AR0101. A Guard will approach if you come near either staircase. The only option to avoid combat is to say you are from Waterdeep AND have an NPC Reaction of 15-20. Go up to the 2nd floor AR0102 via the western staircase into the kitchen. You can only recruit Skie, a True Neutral Human Thief, if Eldoth is in your party. Otherwise she will summon three Guards and flee. When both are in the party Eldoth will mention a ransom that can be collected from Elkart at the Blade and Stars in SE Baldur's Gate. Raid the chest and box outside, and the five bookcases and two locked chests inside. If you talk to Brilla you will need an NPC Reaction of 15-20 to trick her otherwise she will summon three guards. Raid the two bookcases, the locked drawers, locked cupboard and locked chest. Enter the house AR0167. Talk to Pheirkas. You must have a thief (single, dual or multiclass) in your party. She wants Algernon's Cloak. If you don't already have it head to Feldepost's Inn in Beregost and pickpocket Algernon on the 2nd floor. If you already have the Nymph's Cloak you may not feel the need for two cloaks with the same attribute. Raid the barrel outside and the locked chest inside. Raid the bedside table and locked chest. Raid the bookcase and drawers. Raid the barrel outside, and the shelf inside. Raid the two bedside tables, the bookcase and locked cupboard. Enter Degrodel's house AR0161. A pretty difficult battle awaits inside with some guardians. Talk to Degrodel in the bedroom. If you threaten him he will summon some more guardians before attacking. Alternatively you can hear his proposal. He wants you to retrieve the Helm of Balduran. He will give you 6 scrolls of Stone to Flesh. 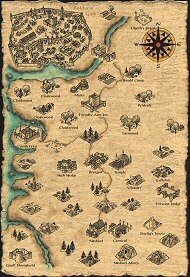 Head to Felonius Gist's house in Central Baldur's Gate. Once you have spoken to Vail and then Quenash return this map and head to the Helm and Cloak AR0116. Go up to the 2nd floor via the back stairs AR0118 and search the trapped painting. Return to Degrodel with the helmet. Position your party so that you can attack him quickly. Give him the helmet and he will betray you by summoning more guardians. Kill him first then deal with his creatures. If you were successful the Helm will be on his body. Raid the barrel outside, and the locked bedside table and locked cupboard inside.